Pencil is FiftyThree’s first foray into the stylus market, and the company has made it an exciting one: The dual-sided aluminum pen integrates deeply with FiftyThree’s Paper app to provide extra tools and control you might not get from simply using your finger. Instead, FiftyThree uses Pencil’s Bluetooth connection to provide special features in Paper like palm rejection, multiple tools from one stylus, Blend mode with your finger, and more. Unfortunately, these extra tools are for Paper only—Pencil works just fine in other apps, but its expanded featureset disappears, leaving it as a regular old rubber-nib iPad stylus. A quick drawn rundown of the stylus: The Pencil is pretty accurate for a rubber-nib stylus, palm rejection is excellent, and you can write quickly without too much trouble. The eraser has a few quirks, however. The look of Pencil has been described as a charcoal stick-like design both in the company’s marketing and by other reporters, and it’s an apt comparison: Though the pen is a little longer and thinner than my art box charcoal, it rocks the elongated rectangular shape with style. Rather than finger-dirtying charcoal, however, Pencil is built out of anodized aluminum (or walnut, if you opt for the higher-end model), with two capacitative rubber ends on each side. The base resembles a long rectangular black eraser, while the pen nib slims to a triangular rubber tip. Like the Cosmonaut, Pencil eschews the traditional rubber bubble nib in lieu of covering the entire sloping tip, allowing users to shade with the side of the tip as one might an actual charcoal stick. This works very well when using Paper’s watercolor tool with the stylus, though it feels a little odd when doing so with one of the app’s smaller-radius brushes (like the pencil or ink tool). The rectangular eraser nib, too, is covered in capacitative rubber from all sides, though it’s much shallower on the pen than the primary nib. The weight and balance of the aluminum body is excellent, and it’s clear FiftyThree spared no expense in design: The pen nib is springy (without being too terribly squishy) and provides excellent resistance, and the eraser is nicely sized—though it does feels odd when the result of the eraser tool doesn’t always match the size of the physical part of the eraser you’ve applied to the screen. My one gripe with the design is in FiftyThree’s choice to provide Pencil with a rectangular body, rather than a round one. It looks more elegant and sits more nicely on a desk, to be sure, but gripping rectangular aluminum edges takes its toll on your hand after sketching for awhile. It’s not nearly as comfortable as I’d hoped it would be to draw with; the Walnut option may provide more comfort, but I can’t say for sure, as I wasn’t provided a review model. All Bluetooth styluses require some amount of power to provide their extra features, and the same is true of Pencil. Rather than the traditional AAA or AAAA battery (which wouldn’t fit in Pencil’s rectangular casing), it opts for a USB-rechargeable built-in battery, which you can remove from the stylus by tugging lightly on the pen nib. The entire nib and what looks like a svelte USB drive pops out; to recharge, just attach it to your nearest USB hub. Be careful that you don’t put the connector in upside-down, as I did initially; if you’ve inserted it correctly, the orange charging light should appear. Once you’ve finished charging up Pencil, pairing is effortless—just open up a Paper canvas and tap and hold the pen nib against the new Pencil icon in the lower-left corner of the tools tray. Light paths around the icon spin a few times counter-clockwise before the icon lights up (to indicate the stylus has been connected) or with a prompt to continue charging the pen. You can also pair the stylus by tapping on the FiftyThree icon in the Paper main menu, then tapping Pencil. While Pencil and its tips work perfunctorily in other apps, if you’re thinking about purchasing this stylus, you want it for its Paper integration. When it’s connected, you gain access to a whole bunch of extra Paper features. Its palm rejection technology is some of the best I’ve used, producing very few errors during the hours I sketched. I’m always hesitant to lay my hand down on the iPad’s glassy screen for fear of accidentally making a mark, but Pencil and Paper managed to persuade me in little time. Pencil’s three other bonus features relate to its nibs and your finger: Paper has mapped each of Pencil’s nibs to a specific tool—drawing and erasing, respectively—and you can choose to use the radius of your finger as either nothing or as a new “blend” tool, which works similarly to the feature of the same name in other drawing programs. The Blend tool’s results are similar to Photoshop’s blend tool. Pencil’s drawing nib works well on the iPad’s screen, though Paper’s built-in brush sizing feels very odd when you’re using the stylus. 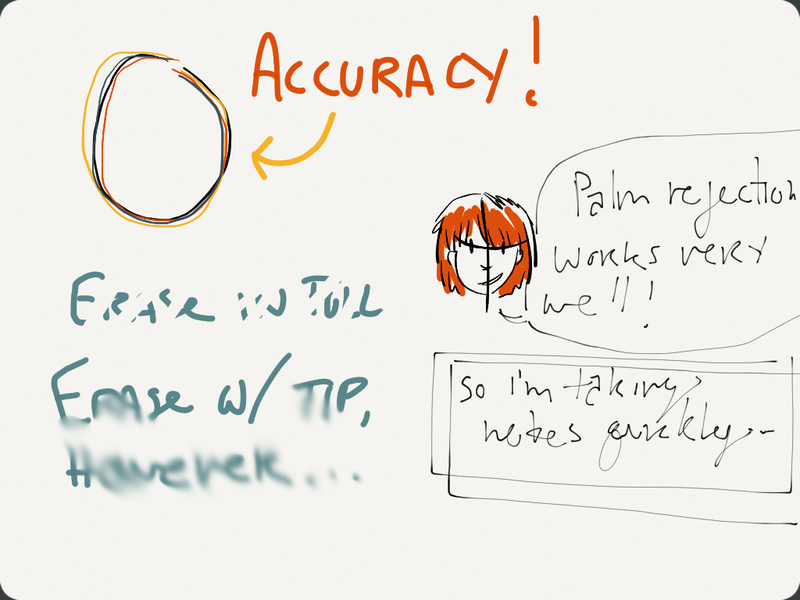 FiftyThree seems insistent on keeping brush sizes tied to how fast or slow you’re drawing, rather than offering you some sort of sizing implementation; as such, certain tools (like the watercolor brush) match perfectly to Pencil’s tip, while others (pencil, marker, pen) are bizarrely tiny in response to the surface area of the nib. I wish the company would reconsider and offer variable sizing for Pencil users, especially when you consider that Paper has already implemented some line variance in its pressure support for the Pogo Connect stylus. I understand the want to keep controls simple and limited, but the whole experience looks wrong when line widths don’t match the larger stylus tip. The eraser falls prey to this problem as well—the actual tool is much smaller than the rectangular nib suggests, and when applying the entire nib to the screen, it’s hard to see where you’re actually erasing. Given that the eraser slopes upward slightly along the edges, I thought I’d angle the nib to get a more realistic feeling, but that produces an odd side-effect: instead of erasing, Paper thinks the small corner surface area is actually your finger, and attempts to blend the drawing. On one hand, it’s a nice shortcut if you prefer not to use your finger for Paper’s stylus-enabled Blend mode; on the other, it’s made erasing lines potentially difficult unless you apply the full nib to the screen. If Paper is your app of choice, the Pencil is certainly an appealing accessory for drawing, writing, and sketching. Its software-based palm rejection is excellent, and the pen’s construction and balance in the hand is top tier. But it suffers from Paper’s odd mapping of both the pen and eraser nib, and doesn’t quite live up to other Bluetooth brethren in the field. I have faith in FiftyThree’s team to get the software kinks worked out in short order, but even so, this stylus seems best suited for the Paper diehards who want access to palm rejection and the Blend feature rather than the general iPad community.